The summer is here and that means trying to figure out what clothes and shoes you need to take on your summer vacation. This can often be a challenge, especially if you don’t feel tall enough. But just because it’s the summer and you’re heading to the beach, that shouldn’t stop you from feeling confident and being taller. We can show you some of the best handcrafted elevator sandals and sliders and help you choose some trendy shorts and swimwear to boost your style and height on the beach. Shorts and swimwear are essential items on any beach vacation, so they will be must-haves on your packing list. But how do you choose? The best shorts to choose to help increase your height are slim fitting ones. Loose fitting and oversized shorts can make you appear shorter than you are. A slim fit will lengthen your legs and slim your frame. The same goes for swim shorts. It’s also a good idea not to have them too long. If they reach above the knee, it will show off more of your leg, giving a lengthening effect. Plain colors can be ideal choices for shorts and can easily be paired with different shirts if required. Nautical stripes can also be perfect for the beach and can be an essential color palette for summer. Stripes can also elongate the frame for a slimming effect. When you’re staying by the beach, sandals and sliders are must-haves. GuidoMaggi offers a whole range of sandals and sliders that are perfect for your beach vacation and can increase your height by 2 inches. So you can even stay tall while you’re on the sand. As well as increasing height, GuidoMaggi elevator sandals can provide you with the comfort you need when you’re on vacation. One model that will add a touch of style to your vacation wardrobe is the Scilla. This ultra stylish sandal can be ideal for both daytime and evening. Featuring cognac calfskin leather, these buckle sandals are handcrafted in Italy and can boost your height by 2 inches, while keeping you cool, comfortable and chic. 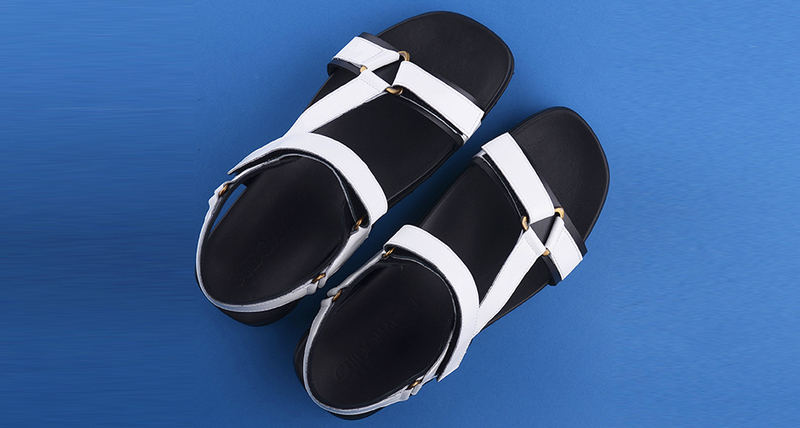 The perfect sandal for your summer suitcase.